The cruise is for the scenery not the food. The food is not good. The view of Paris from the boat was nice. It was an amazing night... everything was perfect! Really good atmosphere ! Not the best as point of view to see the monument but has to be done to enjoy the seine ! This was our first trip to Paris and we wanted to see "the light of Paris". If that's your goal, this river cruise is not the right option. We enjoyed this cruise because it gave us a different view of the sights we had been enjoying during the day. Notre Dame and the Tower from the river, lit up, are spectacular. You are not going to see the beautiful avenues lit up, please keep that in mind. The best part of this cruise for me was the chance to see Paris gliding by, with wonderful live music (piano and violin), a stress free dinner and time to enjoy with my husband. It was worth every penny and I would highly recommend it. The cruise was three hours start to finish - a bit longer than the others advertised. This gave us plenty of time to go the top deck and enjoy the sights in addition to seeing them from our seats at our table. The way the boat is setup almost every single table it at the windows offering wonderful views. Thank you for the interest provided to our company. We are delighted to hear that you have fully enjoyed our cruise. Discovering Paris by boat is a memorable experience which the Bateaux Mouches try to improve and upgrade each and every day. Our main priority is to provide our clients top-quality services and a moment to remember. We sincerely hope to have the chance to receive you on board during your next stay in Paris. Do not hesitate to get back to us for any further information. My wife and I were celebrating my birthday. It was a night to remember and the staff was very nice. Will do this again in the future. Thank you for your confidence and for your review. We are glad to hear that the Bateaux Mouches experience has fully pleased you. The Bateaux Mouches company, the main pioneer of the sightseeing cruises from Paris, would be honoured to have the chance to receive you on board once again, during your next stay in Paris. We shall be at your disposal for any further information. The food that was served was good considering that it is served on a boat with a lot of other patrons. The value is in the total package including the atmosphere. I would recommend this to anyone looking for a romantic dinner on the Seine! We are grateful for the fact that you have taken your time to leave us this kind review and post some photos to better describe your Bateaux Mouches experience. We are glad to know that you have fully enjoyed our Prestige dinner cruise and we sincerely hope to have the chance to receive you once again on board, during your next trip to Paris. We assure you that at the Bateaux Mouches we continue to emphasise the added value of our services in order to provide to our clients an unique approach of the lunch, dinner and sightseeing cruises. We shall be at your disposal for any complementary information. First of all, we sincerely appreciate the fact that you took your time to leave us this review. The consideration given to our customers is a key issue for the Bateaux-Mouches and we are going to rush your feedback in order to improve the Bateaux-Mouches experience. Do not hesitate to contact us on info@bateaux-mouches.fr for any other assistance. 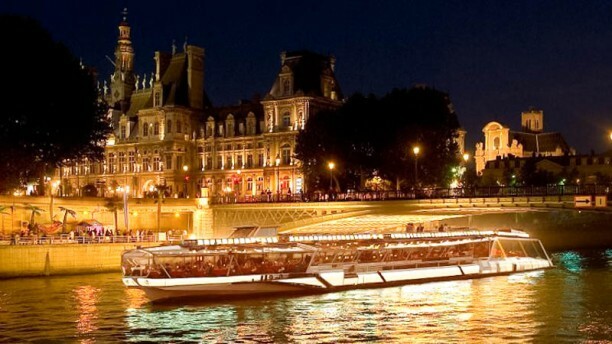 An evening dinner cruise on the Seine is a perfect way to enjoy Paris. Les Bateaux Mouches offers two boats each night with upperscale dining and service. Each table lines the windows of the boat and between courses you can go upstairs to enjoy the view. Great value for the experience and full course one price menu including wine. We sincerely appreciate the fact that you took your time to leave us this kind review. We are glad to hear that you enjoyed your dinner cruise and we hope that this experience fully satisfied you. As you know, the Bateaux Mouches is a world-known cruise provider which tries its best to deliver an unforgettable experience to each client coming on board. Sharing your experience with us means a lot because it may help us improve our activity and getting a new perspective on our services and our clients expectations. We are eager to receive you on board once again, during your next stay in Paris. Do not hesitate to get back to us for any further assistance. We thoroughly enjoyed this dinner cruise! It is truly the way to see Paris. Highly recommend going upstairs between courses to get the very best views of the city and to take the 8:00 pm cruise to see the city come to life at night. We are glad to hear that you enjoyed your 8PM dinner cruise and we hope that this experience fully satisfied you. I have to say, we really paid for the table and the view . . . WHICH WAS WORTH IT, in my opinion. The food - meh. Nothing fantastic. Our price included a glass of champagne to start and a bottle of nice red wine. Our waiter was AMAZING, pointing out the major buildings and attractions as we went along. The piano was pretty good; the violin was a bit loud. In the end, they played to the audience which I guess is what tour musicians must do. The family celebrating a birthday had a lovely time, as did the young man who proposed to his girlfriend on the boat. All in all, had I not had a table right at the front, I would have felt this was too expensive for the price. Having experienced some lovely French cuisine, this paled in comparison. But we did not leave hungry and our waiter and the view was well worth the trip. A great way to see Paris. Oh, and do this at night. The views of the lit buildings was amazing . . . as were the views of the house barges along the banks of the Seine. Thank you for choosing the Bateaux Mouches. I hope you had a nice time on board of our boats and you enjoyed our gourmet food and the view from your table even if it wasn't situated right at the front of the boat. We are constantly trying to ameliorate our services so our clients be always satisfied and never forget the experience they lived with us. Good food, great atmosphere, wonderful scenery. Our waiter was very busy, but service was good and he was very helpful in pointing out special photo ops.